I chose Desert Springs Senior Living because of the size of the room and privacy. For the same amount of dollars, I've got a three times larger space than where I was and a private room. They have bingo and poker games, and they had someone sponsored donuts and coffee this morning. The place is larger and more residents live here. It's older, and like a 2-star hotel. The food is skimpy and they don't seem to have much meal choices. I was led to believe there was a microwave oven and when I moved in, they said if I want it, I have to buy one. It's dark in the lobby and the whole place needs a coat of paint. There's a shopping mall right out in front and I can walk to that. A lot of the residents here need a lot of help. I see quite a few people in wheelchairs and being assisted eating. The place needs brightening up. It's like being in a hotel where you're traveling and you don't know anybody. Everything at Desert Springs Senior Living was nice, including the room, but it wasn't furnished, so that was a big hurdle. There was a very nice, big open area with a reception desk and a little room off to the side with a fireplace and a fish tank. The manager was very nice. I saw people eating, and they had a lot of activities when we walked around. The place was clean and very nice. Desert Springs Senior Living was good and it's very convenient. The staff during the tour was very friendly and very informative. I saw a one-bedroom apartment with a studio type kitchen. The food wasn't the greatest, but it was edible. It wasn't real tasty from my point of view. They had a class going on for basket weaving when I was there. They had a beauty shop, a common area, a library, and a dayroom where they do activities. Desert Springs is pretty nice. The rooms are a little small. They provide three meals a day, DirecTV, and all utilities. The staff member who showed me around was very helpful. I loved Desert Springs because the people were genuinely friendly and nice. I enjoyed it. I had lunch with one of the nice young ladies in charge. The dining area was nice and had an atmosphere of friendly people, and the food was good. They have small portions, but it's enough. The room I saw was a little bit small. Desert Springs Senior Living was a nice place to stay. The amenities and activities were fine. They had poker games there. The food was fine, too. Everything was nice at Desert Springs. They showed me a small unit and a one-bedroom unit. Some rooms had refrigerators and some had microwave ovens. They're unfurnished, so you have to furnish it. The dining room looked fine. The staff member who assisted me was good and knew what she was talking about. The only thing is that Desert Springs Senior Living doesn't apply to us because my wife has dementia, so she has to go to a different place. Desert Springs Senior Living was recently renovated and it was very nicely laid out, very pleasant, and very clean. The staff was wonderful. Even the residents were very pleasant. It was a very nice community. They had a big board of activities and an activity room. Desert Springs had a lot to offer and activities going on. They served three meals a day. The staff was very personable, very helpful, and very knowledgeable about the community and what it had to offer senior citizens. The residents were very congenial and very pleased with the operation. We visited Desert Springs. It was a nice community, and it was affordable. The staff members were very nice and friendly, and they have every amenity that all the other places do. The apartment was larger than most places, and they actually have a stove in it (where the other places did not). They have games for the residents like Bingo, and scheduled activities along with transportation. Grand Court Las Vegas (Desert Springs Senior Living) was very nice. It was an elaborate group home with amenities and had a very nice layout. I would definitely recommend this place. The room that I saw was very compact, clean, and accessible. It was like an enlarged bedroom. I was disappointed with Desert Springs. The main entrance was through the strip mall, so it was difficult to find. When I found it, the staff member wasn't overly welcoming, did not recall my appointment, and did not invite me into her office. She gave me a very quick tour, took me back to the reception area, and gave me literature. It was very haphazard, which turned me off. They should get a good sales and marketing manager and some signage. My mom moved into Desert Springs, and so far, it's pretty good. She participates in the activities. They're pretty caring, and anytime I call and ask them to do something, they do it. It's an older property, but it's well-kept, and she says the food is excellent. The have a poker room, game room, and crafts. She's in a studio, but they offer a lot of options for accommodations. I spent over a year and a half at Desert Springs. It's independent and assisted living. It's very nice. It's a single building with three levels. Unfortunately, it doesn't have a pool, but it has elevators, so you don't have to use the stairs if you're on the second or third floor. They have a great staff. They have nurses and qualified attendants on duty at all times. The food was why I left. When I first got there a couple of years ago, the menu was adequate. It wasn't anything you'd really write home about, but the food would sustain any individual. About eight months before I left, the management got into a financial problem, so one of the things that they did (to my understanding) was to cut down on the quality of the menu. That's what drove me out, because I just wasn't seeing anything healthy with the food that was available. I was either dining out or I was ordering delivery and things like that. I finally just decided that if I'm going to be doing this, I might as well go back and live in my own home. They used to have dancing, two nights a week they had Poker, and they had bus tours, casino tours, and shopping tours, anything you needed to keep you busy. They have once a week housekeeping and even though I didn't want them to, they changed the sheets on my bed and cleaned the apartment from top to bottom. It was great. If it wasn't for the food, I would be back there, or I would have never left in the first place. Desert Springs Senior Living was really nice and homey, but it's an older facility. Everybody was really wonderful there. I really liked it. I wanted to put my dad in there, but it wasn't for him. He needed more care and couldn't afford it. I'm worried about distribution of his medication because he's lazy and not going to do it. I needed to put him some place where he had a nurse, so they could distribute his medications to him. I checked the menu and I looked at the dining area, and it's beautiful and very nice. Activities were wonderful. People were watching in the TV room and there were people mingling and talking. I know someone who lived there and they treated him wonderfully. The person who assisted me was excellent. She was so good to me. I toured Desert Springs. It didn't leave with me a powerful impression. It wasn't as nice as the other places, but it certainly was up there with the best of them. It was well done. Somebody paid attention to the design, the selection of the materials, and the building of it. They had a schedule of activities. It was outside my budget. Desert Springs was wonderful, very clean, and welcoming. They were very courteous and the rooms were nice. The people there were quite old and I'm just not in that age bracket yet. They serve three meals a day and they have laundry facilities. There were all kinds of groups and clubs for everybody, like crafts, movies or TV programs, dancing, birthday parties, and so on. It was just wonderful. Back in March, I was able to visit Desert Springs for my mom. The place was very nice and clean. The staff was professional and very informative. They have games and field trips for their activities. Their apartments are of decent size. Their dining room is very nice as well. Last week, I visited the Community with my husband and mom to look for a place for my mom. I appreciated the warm welcome, nice atmosphere and friendly staff. They were very accommodating with us and my mom. They made us feel 'at home'. We had lunch in the Dining Room and the food was very good. My mom was very impressed with the apartments that we looked at. She thought they were very spacious, clean and affordable. The community was also remarkably clean and uplifting. We look forward to moving mom in and visiting her often. We had been shopping for a home for my mother for quite some time and we found that Desert Springs is the perfect fit for her. Desert Springs is such a wonderful facility, they have really turned the building around in the past few years, it looks brand new with all the curent upgrades. The care staff is very helpfull and polite I never have an issue getting help or any questions answered. I saw on the news they recently won local and national awards one of them for the food. Curently having my loved ones their I can honestly say I would recommend this facility to anyone looking for an: affordable, clean and we'll ran Senior living either for yourself or your family. Desert Springs was old, outdated, dirty, and I noticed the care providers being rude to the guests. I was not impressed, and I would not recommend it. I am so sorry to hear you feel this way about your visit to our community. Nearly 100% of our reviews which consist of visitors and actual family members of our residents have given positive feedback in regards to the friendliness, customer service of our staff, and the cleanliness of the community. I hope you will consider revisiting and giving Desert Springs another chance. I could go to Desert Springs Senior Living. Everything was fine. The maintenance, staff, and location were good. Everything at Desert Springs was really good. They had really nice rooms that were a pretty good size for the price and pretty well-kept. The staff, the facility and the dining were very nice. The dining area had a restaurant-type setting. They had a shuttle, bingo nights in a bingo room, a game room, and a movie theater-type room. It was all very nice. I didn't see anything negative. The people at Desert Springs Senior Living were very helpful and very attentive to our needs. I'm thrilled that my father is very happy there. The atmosphere is warm, caring, and clean. The staff is professional, punctual, attentive, and very supportive. I can only say good things about them. The rooms are clean and well maintained. For the price, I think it's a bargain. My father likes the food, considering he is a picky eater. Desert Springs Senior Living is a nice place. The apartments were clean, and of decent size for the price you’re paying. The facility is clean. The staff seemed to always care about what’s going on with my mom. They are very friendly, and very concerned of their residents. My mom was in Desert Springs near my house before she passed away. She hated the food. The service in the dining room was terrible because people were untrained and had no clue how to wait on the tables. They had a menu, like you’re going to a restaurant. The staff didn’t look professional and didn’t know what they were doing. I really don’t know what happened before she died; she told me they never came right away when she pushed the buzzer, just when they got around to it. I think the bed was kind of high, and my mom was short. I thought the place was a little pricey. The facilities were very nice and included a nice library and a karaoke place. I saw them playing poker. They do your laundry, but they don’t necessarily get your laundry back to you; you might get somebody else’s. My good friend is in Desert Springs. It is just a block away from where he lives. It is really good. The staff is really helpful and caring. The room is really nice. He enjoys it a lot more than the rehab he used to be in. This is a whole lot better. He enjoys every bit of food. They have quite a few activities, but he is not really into activities. They play bingo, cards, and go out, but he likes watching TV and goes for walks. They provide good services there. The staff in the kitchen area is really good, really nice, and knows everybody by their first name. My mother is in Desert Springs Senior Living. It is competitively priced overall. They do not have many outdoor activities, but they have games and all kinds of activities for them to do, like bingo and poker. They offer three meals a day and health services, but she did not have to do that because she has a nurse practitioner that comes every week. From what I see so far, she is doing better than where she was previously, but she is still in the adjustment phase. Desert Springs Senior Living was not as clean because it was older, but the people were pleasant. There was some kind of strange smell that was not on par with what I wanted for my brother, but it was not really a bad place. The staff was very pleasant. I have toured several of these places. What I liked the most was the feeling that I got when I walked in. Even though the building is very old and not as nice as some of the other ones I went to. I liked that the staff were genuine with me and the people who lived there. The residents seemed very happy and were quick to tell me how happy they were. The BEST part was that they were able to work around my budget, (which is not that much) I am happy with my choice to place my mom at Desert Springs. The best way to get to know a community is by scheduling a tour. See the facilities, meet the staff and residents, and get a feel first hand what it's like to live at Desert Springs Senior Living Assisted Living. 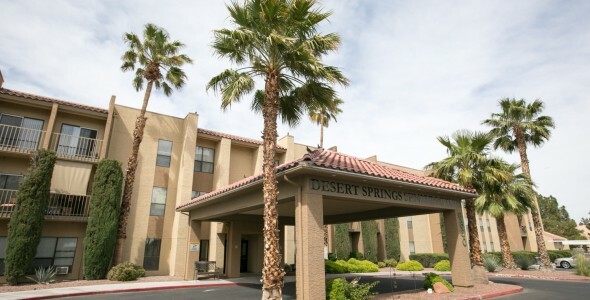 Located just minutes from the West Flamingo Senior Center and the Rainbow Springs Shopping Center, Desert Springs Senior Living offers everything families are looking for in an assisted living community. We've thought of all the little extras that make life carefree allowing our residents to enjoy a rich and vibrant life. Desert Springs Senior Living is operated by the Ensign Group. At our communities we provide seniors a broad spectrum of services, from skilled nursing to assisted living services and rehabilitative services. Desert Springs Senior Living offers a variety of inviting accommodations to suit any taste. Many of our spacious studios, one- and two-bedroom apartments include plush wall-to-wall carpeting,walk-in showers, fully equipped kitchens and emergency response systems. To make you feel right at home, we encourage you to bring your small pets. Throughout our community are many places where residents gather during the day. The community room plays host to a variety of activities such as poker, arts and crafts and movie nights. Outside in the private courtyard are walking paths which are perfect for taking a stroll with a pet. We've taken care of all the little details to make life easy. Our friendly housekeeping staff will clean your apartment on a scheduled basis. All meals are served in the warmth of our restaurant-style dining room and are prepared daily by trained chefs, using only the freshest produce, meat and seafood. We also offer scheduled transportation for shopping, dining and medical appointments. There is also an on-site full-service salon which saves a trip into town. While we encourage an independent lifestyle, our staff is available 24 hours to respond to emergencies. Through our Health and Wellness program, residents are able to enhance their physical well-being. When it comes to independent and assisted senior living, Desert Springs Senior Living offers something for everyone.